On several tracks Don Laka is listed as playing ‘all other instruments’ thus identifying him as pianist on several otherwise un-credited piano contributions. Bokone closes Black to the Future seemingly without Masekela, but with effective guitar contributions from Kenny Mathaba and John Selolwane. 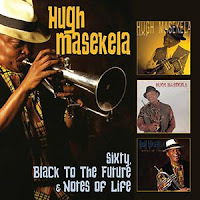 The third album – Notes of Life – was actually the first of the three to be recorded and it has a soul-jazz feel to it with its soft-focus backing vocals and synth keyboard sounds. Bassist Trevor Gordon, one of four heard on this disc, restrains his fretless jazz bass inclinations on Moments of Love, fine collective vocals take centre stage on Father of Our Nation (comp. H Masekela/Cedric Samson) in praise of Mandela - ‘father of our freedom’ they sing, and the all-too-short salute to Mandela Thank You Madiba brings to a close almost three hours playing time of the music of Hugh Masekela. Sixty/Black to the Future/Notes of Life is available now.